EKKLESIA. A REVIVAL OF AMERICAN HYMNS. Hattiesburg, Mississippi, is in the heart of a country steeped in tradition, storytelling, religion, and music. 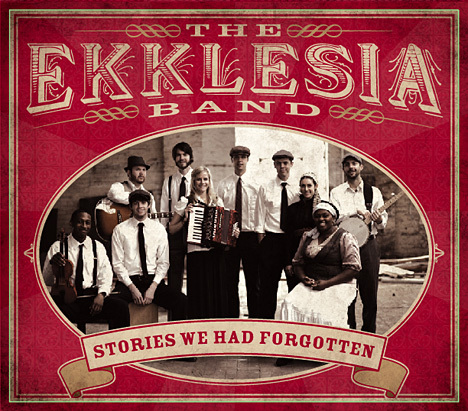 All of these elements seem to come together in the album “Stories We Had Forgotten,” a collection of classic American hymns made new in a unique treatment by the band Ekklesia (the emphasis is on the “si”), some dozen musicians from the Hattiesburg “community of faith” of the same name. Hattiesburg is also in the heart of a country that is still rebuilding itself from one of the world’s worst natural disasters. This sense of renewal, if you will, is a part of Ekklesia’s geography, as well as their music and their spiritual lives. 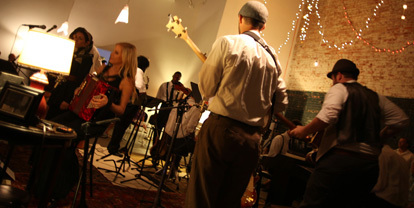 The album’s graphics and the band’s photo are in a Depression-era style; Barker explains the theme as centering on a 1930s traveling Revival band. Some of the members of Ekklesia have played together for a decade, and some for just the three years that the church Ekklesia has existed. Many have roots in Southern music. Drummer and vocalist James Wilcox grew up singing in a traveling family band around the South. The father of Lindsey Smith, piano, accordion and vocals, was a professional bass player in a rock band that opened for Dolly Parton. Justin Dallriva inherited the banjo from his father. 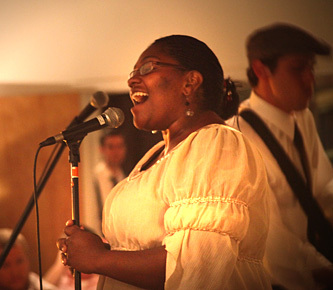 Vocalist Kate Barker has even sung at Carnegie Hall, with her high-school choral group. Toby Barker’s grandfather played for three weeks with the Glen Miller band during World War II. Several members of the group, which includes vocalists Cash Carr and Sharon Miles, bass players Josh Thomas and Kevin Scott, pianist and organist Steve Adamson, and Zach Jones and Taylor Willis on violin, are pursuing their own musical careers besides playing at Ekklesia. Part of that more creative way, for instance, can be found on the song “Marching to Zion,” Barker’s favorite song on the album. While working on it, he couldn’t get Chris Tomlin’s “City of God” out of his head. “The bridge of that song, ‘Greater things are left to be done in this city,’ stuck with me,” Barker says. “The mission never ends. When we begin to bring the Kingdom of God to a community and its people, we must remember that greater things are still to be done.” So they “teamed” the two songs together.